I've been reflecting a lot lately on inspiration and those who inspire me to be the best person I can be. Even before Grace was diagnosed with INAD, my life has always been full of people setting a great example for me. From elementary school teachers who became friends to lifelong friends who have shared crazy experiences with me, I have a long list of people who continue to inspire me. But since Grace has been diagnosed with INAD, I find myself inspired by those who fight so hard for inclusivity for all and those who find a way to make a difference even in the toughest of circumstances. This month, I would like to tell you about my friend, Alexis Wernsing, and even though she lost her earthly battle in 2015, she continues to provide hope for so many. I first met Alexis through the newspaper. Let's face it, that's how I meet most people. But I was doing a story on accessibility in Litchfield, particularly at the downtown post office. And Alexis, who spent her life in a wheelchair due to cerebral palsy, was always a champion for better accessibility issues. I enjoyed an extremely positive interview with Alexis, who would certainly have had reason to complain about poor accessibility, but never did. In fact, I never heard Alexis complain about anything during the time I knew her. She took the toughest of life's challenges and found a way to not only be successful in her endeavors, but also to be happy. Despite her physical limitations, Alexis earned her associate's degree at Lincoln Land Community College and attended college to study art at the University of Illinois in Champaign. She was eventually awarded a degree posthumously for all of her hard work. You can even see some of her graphic design work proudly hanging up in her dad's store in downtown Litchfield. One of my favorite stories we ran in the paper was about a voice amplification project at the University of Illinois that a group of students were developing. Alexis sent me the article for the paper, but also specifically asked me to contact the members of the development team to learn about their work first hand. Alexis has always been an inspiration because of her passion for life and her determination to meet every challenge head on. 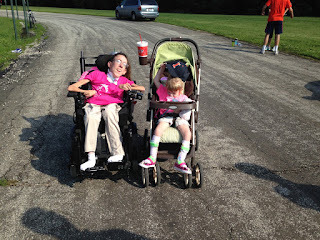 But it was after Grace was diagnosed with INAD that Alexis became even more of an inspiration. She began following our story and our blog. For one of her birthdays, she asked her friends to donate to INAD research instead of giving gifts to Grace. Throughout that year, she routinely did things for Grace. An avid St. Louis Blues fan, she brought a game-used puck home from a game for Grace (and it still sits on Grace's dresser). She picked out a ladybug bank for Grace, and one of Alexis's friends got Grace an Illini stuffed animal so we would know they were praying for Grace too. 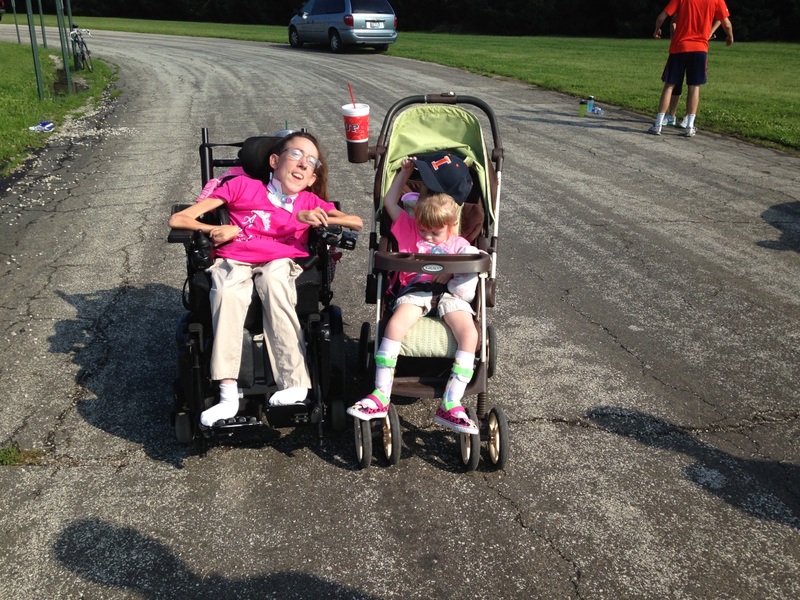 Even though it started very early in the morning, Alexis and a friend came to a 5K fundraiser for Grace in Raymond. They brought Grace an Illini hat, which she promptly took off her head (mostly because she didn't care for hats, and not because her mommy is a big Mizzou fan). Before she went back to school that fall, Alexis and her mom, joined us for a special ice cream date at Dairy Queen. It was so much fun to chat together about her goals and her dreams, and she just loved being with Grace. Unfortunately, that was the only time we would get to share ice cream, as Alexis passed away that fall. And although her earthly battle is over, her passion and love for life continue to live on through a scholarship in her name at Lincoln Land Community College. As for me, I keep a string of text messages on my phone that we shared. There's one where she thanked Kyle for an article he wrote in the paper. One wishes us a happy 4th of July. And then there's several messages where we planned an ice cream date. The messages are full of emojis, which make me smile, because they just remind me of Alexis and her spirit for life. Even when some health complications sent her back home from school, Alexis didn't complain. She texted me that God had a plan and he would see her through. That's such an inspiration to me and a great reminder that no matter what life's challenges I encounter, God always has a plan. My wish for everyone is that we would all embrace life just like Alexis did and live it to the fullest, meeting every challenge head on and always keeping a positive attitude. I know that would certainly make Alexis proud. While I don’t necessarily consider myself up or down, I understand the significance of Mizner’s words more than ever since we started our journey with Grace and our fight against infantile neuroaxonal dystrophy. We had an AWESOME day with the softball team from Purdue Northwest! My beautiful wife Mary and I have witnessed time and time again the generosity of those whose lives we’ve touched in one way or another. They’ve held fundraisers. They’ve sent cards. They’ve just been there for us. Grace got a new helmet at softball, both signed by all the players! Part of that is due to Grace, who still has the ability to light up a room even though her fight against INAD has taken its toll on some of her abilities. The sparkle in her eyes and joy in her smile is still there though, even if her body won’t always let her show it in other ways. It was a nice weekend getaway for our family! I believe that the other reason people have embraced our Grace-Filled Journey is because of the way Mary and I have shared our story. By making the community part of our journey, people seem to feel compelled to share with us. Our pain is their pain, but our joys are also their joys. Coach Stansell helped Grace and Charley throw out the first pitch! The fundraisers are nice (name another community that could raise more than $150,000 for a rare disease like INAD and still have time and money for dozens of other worthy causes), but the awareness is huge for us. By continuing to share Grace’s story with people who may never have heard of INAD beforehand, we extend Grace’s legacy of hope and message that none of us are guaranteed a tomorrow, so make the most of today. We had one such opportunity this weekend, at the Purdue Northwest University softball game in Hammond, IN. Our connection with Purdue Northwest is like most connections in the world, it’s not what you know, but who. I had the opportunity to get to know Marty and Kara Steffens of Litchfield while covering their son Mason and daughter Tessa when they played for the Purple Panthers from 2009 to 2015. We found out about Grace’s condition around the same time Tessa was finishing up her prep basketball career and Marty has been a big supporter of my family since we shared the news. Tessa would go on to sign to play softball for Purdue Calumet (Purdue Northwest’s predecessor) and it’s been awesome following her success at the next level. Her team also gave Grace a signed helmet during Tessa’s freshman season, officially making them part of Team Grace. While we’ve followed them from afar, Hammond is a little bit of a trip from Hillsboro and we hadn’t the opportunity to see them in person until this past weekend. Marty, who spearheaded the awareness idea Tessa’s freshman year, spoke with the Pride’s new coach Niki Stansell about raising some more awareness for Grace and INAD. The team getting ready for the game! Coach Stansell was all for it, even though we’d never met her. Last fall, we set a date in April, with the hopes that it would be warmer than when the Pride start their season in February. 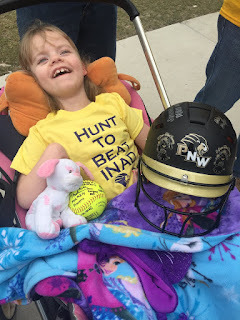 The plan was to have Grace throw out a first pitch, or at least assist in it, while the team would sport INAD awareness T-shirts during their warm-up. We opted for the phrase “Hunt To Beat INAD” which incorporated both our goal and the Pride’s hunting rallying cries associated with their lion mascot. Creative Flair made the shirts, which were gold with purple lettering, and we were good to go for the game. The whole trip was a much needed break for our whole family. We headed north after Grace’s physical therapy appointment in Springfield on Friday and while it was a long time in the car, it was great to be together. After dinner, Mary took our one-year-old, Charlotte, swimming. Charlotte, aka Charley Danger, has provided us with a new parenting experience, hitting milestones that INAD stole from Grace. It’s been an adventure, but a great one. 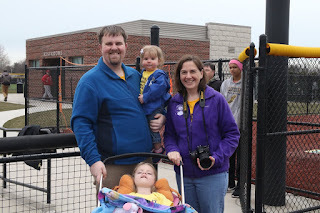 When we got to the softball field on Saturday, we were greeted by the Steffens family and the girls were all smiles to see them (alright, Charley glared at Tessa at first, but warmed up later). It was pretty impressive to see the whole team warming up on the field in their Grace shirts. We got the chance to meet Coach Stansell and some others from the university, all of whom treated us like we were the most important people in the world that day. Charley and Marty Steffens had a hug for Coach Stansell. After the player introductions and national anthem, we made our way to the field for the first pitch. We decided to let Charley help Grace with the throw, or that was the plan. Like always, Charley had other ideas. Finally, with some cajoling from Coach Stansell and Tessa, she would let go of the ball for long enough to qualify as a first pitch. It wasn’t a strike, but it was perfect (a video is on the Grace-Filled Journey Facebook page). After a quick picture with Grace and the Pride, it was time to play ball. The goal of finding a game where it wasn’t freezing worked, but just barely as it was still pretty chilly, the norm in Northern Indiana apparently. Mary fed both Charley and Grace, with me taking over Charley corralling duties. She has nearly mastered walking, which means that sitting and watching a softball game wasn’t high on her priority list. Thankfully, there was a lot of room to roam where I could still keep an eye on the game as well. Unfortunately, the Pride lost, with Tiffin University tossing a two-hitter. The girls were getting pretty tired by the end of that game and we opted to head home before the start of the second game of the doubleheader. We said our goodbyes to the team, got some hugs and hit the road back to Montgomery County with the promise of coming back next year. More than anything, these trips reenergize Mary and I. To see people who are inspired by Grace’s story never gets old and makes us want to fight even harder for our little girl. Life on the journey to beat INAD is rarely fun, if ever, but the people that we’ve met along the way make us know that we wouldn’t trade it for the world. Morrisonville biology students were treated to special guest speakers on Monday, April 9. Kyle, Mary, Grace and Charley Herschelman of Hillsboro spent just over an hour in their presence sharing their story about INAD (infantile neuroaxonal dystrophy), in vitro fertilization and an exciting new potential drug study to slow the progression of this disorder. Grace got her photo taken with all the students and staff who wore Grace shirts for our visit. This is the fourth consecutive year that the students at Morrisonville have been blessed to have this family share their genetic experience. Prior to their arrival, the students and faculty participated in a friendly competition to raise funds to support their ongoing mission to bring awareness to INAD and to aid the family with expenses. This year, every first hour teacher sold raffle tickets for students to win several prizes including various desserts. The final winning ticket was drawn by Kyle and handed off to Mary to reveal the winning class that would be treated to a gourmet meal provided by the staff. Congrats to Mrs. Frisbie’s math class! During the four days in which the tickets were sold, students raised $825. When asked what their favorite part of Grace’s visit was, students stated that they loved watching Charley interact with Grace. They also loved how Grace would respond with a huge smile to their laughter after Kyle slipped in a hysterical one liner. This was Charley's first visit to Morrisonville, and she loved meeting all the students. Students also remarked on how inspiring Kyle and Mary are as parents and the wonderful opportunities they provide for Grace and Charley. Morrisonville Junior and Senior High School are very proud to be part of this Grace-Filled Journey.